Here is the perfect breakfast treat, a small breakfast slider. These tasty little sweet potato biscuits filled with crispy bacon and fried egg would be the perfect start to any morning. It works as a quick grab and go breakfast or a relaxing start to the day with the morning paper. 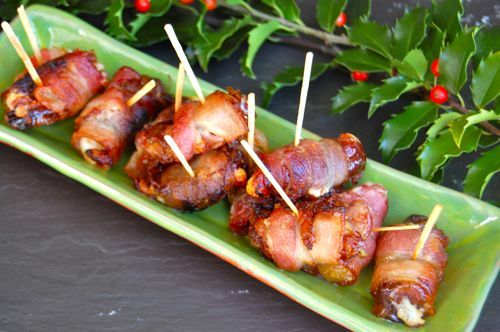 You’ll love these little sliders……maybe try for New Year morning! 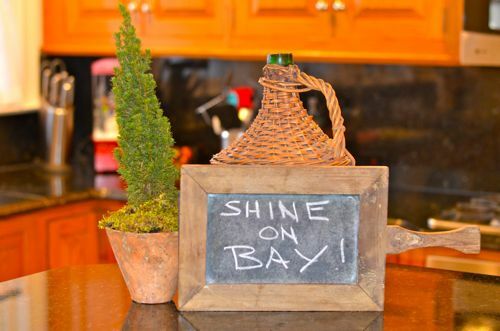 From by the bay, wishing you sweet food memories! 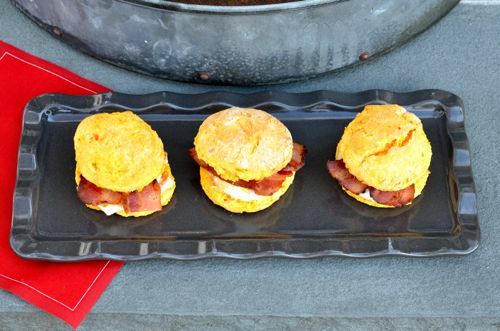 For each slider use one sweet potato biscuit sliced in half ( recipe follows), one fried egg done to your liking, one slice of crisp bacon cut in half. 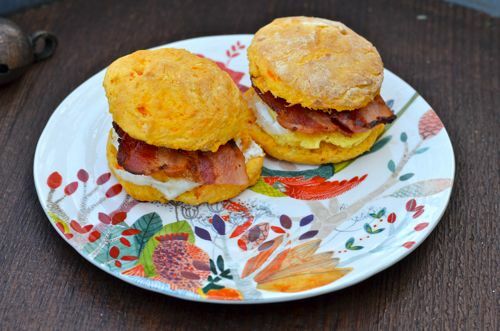 Assemble egg and bacon inside the biscuit . I use the biscuit cutter to make the fried egg the same size as the biscuit. Preheat oven to 425. 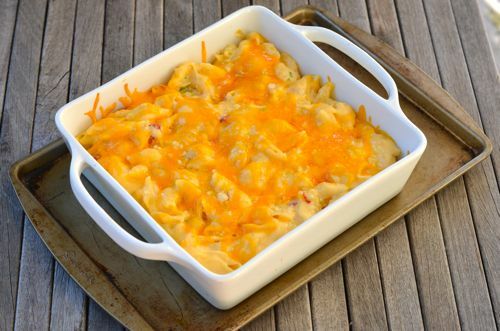 Grease baking sheet with butter, oil, or cooking spray. In a small bowl whisk together the sweet potato and milk (less up front, and more if needed). Set aside. 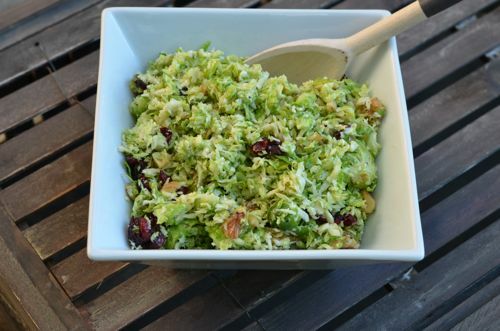 In a large bowl, whisk together the dry ingredients. Cut in the butter with a pastry cutter (or a fork if you don’t have a pastry cutter) until the mixture is a crumbly texture or resemble coarse meal. Add the sweet potato mixture and gently fold to combine. Add the remaining milk a little at a time until all of the flour is moistened. The amount of milk you will need will depend on the moisture of the sweet potato. Sprinkle a small handful of flour on a work surface. Turn the dough out onto the surface and knead lightly 2-3 times with the palm of your hand until the dough comes together. Pat the dough out into a 1/2-in thick round. 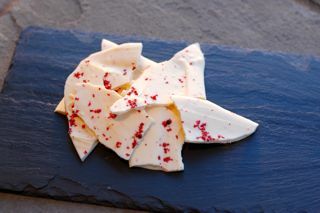 Using a 2 1/2-in round biscuit cutter, cut the dough in to biscuits, Gently reroll the scraps and cut out more biscuits. Place on to prepared baking sheet and bake 12-14 minutes or until light golden brown and firm to the touch. Serve warm or at room temperature. 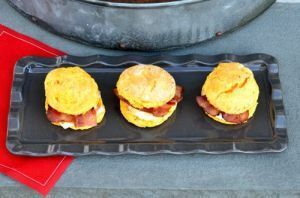 This entry was posted in breakfast and tagged bacon recipes, biscuit recipes, breakfast recipes, egg recipes, sweet potato breakfast slider, sweet potato recipes on December 30, 2014 by entertainingbythebay. From by the bay wishing you a very happy holiday and may you get your shine on! This entry was posted in Uncategorized on December 25, 2014 by entertainingbythebay. 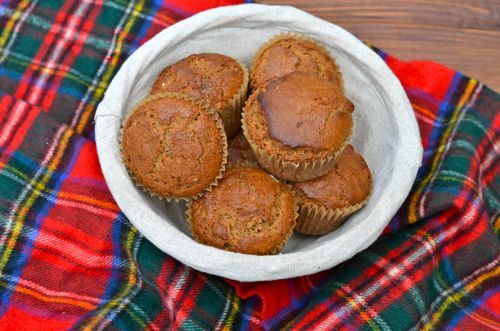 Welcome your holiday with these easy and delicious gingerbread muffins. I can’ t think of a better way to wake up on Christmas morning then to the aroma of these muffins. It’s a special way to start the day. I suggest measuring out all your dry ingredients the night before or in advance and set aside in plastic storage bag until you are ready to make the muffins. It makes for an easy breakfast. The cinnamon and spices will make your home smell of Christmas! 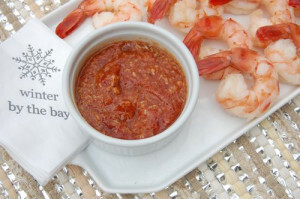 From by the bay, wishing you special holiday food memories! Preheat the oven to 400 degrees F. Grease or line a 12-cup muffin pan with paper muffin cups. Combine the flour, baking soda, baking powder, and spices in a large bowl. Whisk the egg in another bowl, then add the brown sugars, making sure to break up any lumps. Add the milk and vinegar to the egg-brown sugar mixture then measure in the oil with a tablespoon. Use the same oily spoon to add the corn syrup and molasses so they don’t stick to it. Whisk the mixture to combine and add to the flour and spices. Stir until mixed but still fairly lumpy-the mixture may be more runny than you expect for muffins- but you need the dense stickiness of gingerbread, rather than a cakey crumb. Spoon or pour the mixture into the muffin cups and bake for about 20 minutes until the tops are dry. This entry was posted in breakfast, muffins and tagged Christmas foods, Christmas recipes, easy muffin recipes, ginger recipes, gingerbread muffins, gingerbread recipes on December 21, 2014 by entertainingbythebay. 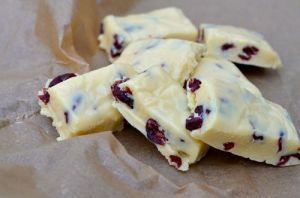 Another easy recipe perfect for gift giving or to add to your holiday cookie platter- cranberry white fudge. 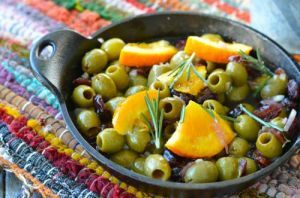 It uses just a few ingredients, it taste delicious and it’s oh so pretty !!! 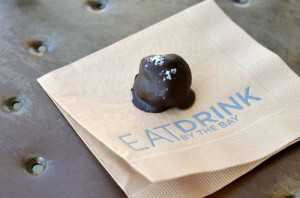 From by the bay wishing you fudge filled holiday memories! Place the chopped chocolate, condensed milk, butter and salt into a heavy-based pan over a low heat and stir until melted and well combined. Add the cranberries to the melted chocolate mixture and stir well. Pour the mixture into a 9in square tray, smoothing the top with a wet palette knife. Let the fudge cool, then refrigerate until set. Cut into small pieces approximately 1in x 1in pieces. Once cut, the fudge can be kept in the freezer – there’s no need to thaw, just eat straight away. 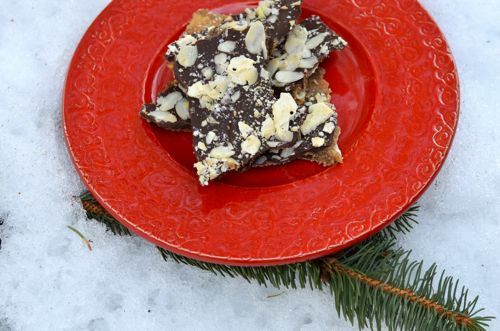 This entry was posted in candy, desserts and tagged chocolate recipes, cranberry recipes, cranberry white fudge, food gift recipes, fudge recipes, holiday recipes, white chocolate recipes on December 18, 2014 by entertainingbythebay. 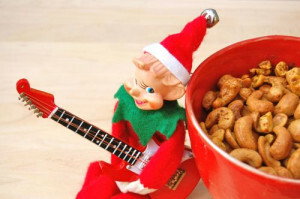 Looking for easy food gifts to share with friends and family , look no further and try one of these easy candy recipes! From by the bay, wishing you a sweet holiday! Preheat oven to 350 degrees F. Prepare a baking sheet by lining it with aluminum foil and spraying the foil with non stick cooking spray. Arrange the crackers side by side in a single layer on the baking sheet. In a heavy medium size saucepan place the butter and brown sugar. Stir while the butter is melting and then bring to a rolling boil. Remove from the heat and carefully pour over the crackers on the baking sheet trying to cover all the crackers. 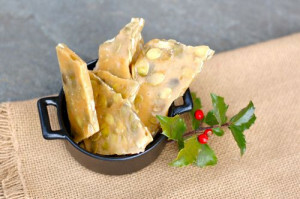 Place in the oven for about 5 minutes, so the toffee bubbles and spreads across the crackers. Remove from the oven and cover with the chocolate buttons. Put back into the oven for 1 or 2 minutes so the chocolate softens. Remove from oven. 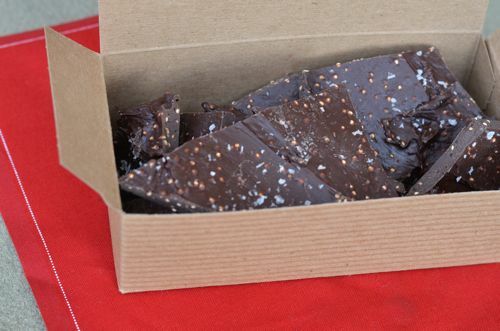 Use an offset spatula to spread the melted chocolate evenly covering the entire surface of the toffee. Take 3-4 saltines and crush them into small pieces. Sprinkle on top of the chocolate while it’s still sticky and soft. Next sprinkle the almonds on top and finally the sea salt. Place the pan in the refrigerator for at least one hour, to cool and set. Once set, break into smaller uneven pieces and serve. Store in an air tight container for up to 10 days. Line a rimmed baking sheet with parchment paper. Spray parchment paper with Canola oil. Take a large non-stick pot and add sugar, butter, corn syrup and 1 1/3 cups water. Place on high heat melting sugar until the caramel turns amber color, stir occasionally as this is cooking. This might take awhile, it will thicken as it boils before it finally turns amber. At this point add the baking soda and salt, then remove from heat and add the pepitas. Stirring well, then quickly pour onto the baking sheet and spread out evening with a spatula. An alternate method for a smoother brittle is slide the parchment paper out of the baking pan and onto a smooth counter top. Cover with another sheet of parchment paper and use a rolling in, to smooth the brittle and roll it out thin. Once the brittle is rolled out you can remove the top sheet of parchment paper and let the brittle cool and then break into pieces. 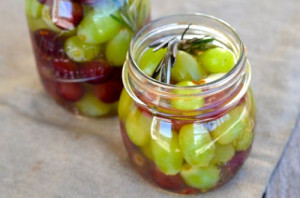 If you can resist eating this , store in an air tight container. Place the quinoa in a small skillet over medium heat , shaking the pan gently until the quinoa starts to puff and darken in color – this will take 3 to 5 minutes. Remove from heat and let cool. Line a baking sheet with parchment paper and set aside. In a bowl add the melting chocolate and heat in the microwave for 1 minute. Remove and stir until smooth. Repeat until another 1 or 2 times until the chocolate starts to melt. Keep stirring to finish melting the chocolate. Mix in the toasted quinoa and bourbon. Pour and spread the chocolate onto the parchment lined tray. You can use an offset spatula to help spread the chocolate into a square about 6 by 8 inch square. Sprinkle with sea salt. Let cool and harden. Break into pieces to serve. This entry was posted in candy, desserts and tagged almond recipes, Bourbon recipes, brittle recipes, candy recipes, chocolate bark recipes, chocolate recipes, food gift recipes, holiday recipes, pepita brittle, quinoa recipes, toffee recipes, top homemade candy recipes, truffle recipes on December 15, 2014 by entertainingbythebay.